Odessa Primus is the Executive Director of the Global Arena Research Institute (GARI). She is the founder of the think tank Go Think Initiative, a board member of the Czech & Slovak Club Alpbach and Vice-Curator of the Global Shapers Prague Hub of the World Economic Forum. 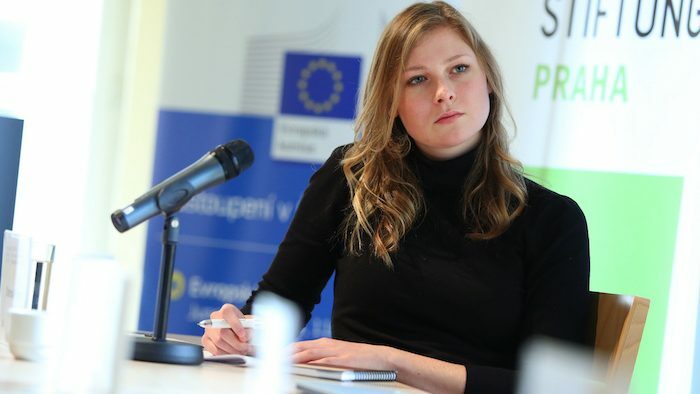 Odessa is an expert on migration and new media and regularly speaks at a variety of institutions, including European Commission directorates, One Young World, European Development Days and the European Economic Congress. I have always been very attracted to the natural sciences (physics, chemistry and biology) but never disciplined or studious enough to be able to pursue them. While being completely encompassed in the world of social sciences for so long and being very happy there, I always found that there were no clear answers, it was not maths and it did not follow a rule that could determine the answer or outcome, so, naturally, I was constantly frustrated. I kept finding solace in focusing on things like algorithms or complex technology that seemed to be very explainable and quite direct. I was very excited about the Global Arena Research Institute (GARI), and as I became more involved I gained a better understanding of what the project is: it’s trying to offer a visualisation of globalisation, what’s going on, in a fact-based and comprehensive way. This doesn’t exist yet, and the potential is simply overwhelming. The GARI has set out to “develop a complex and multidisciplinary centre that would crucially enhance capacities to base our understanding of the global arena on comprehensive, complex and almost real-time data”. How does the GARI do this and what are the most significant challenges faced in achieving this goal? The GARI is an independent non-partisan research organisation. It combines the most advanced methods of AI-driven data, scientific and other artificial reasoning capabilities to open up data science to new opportunities. Our goal is to provide insights into the nature, impact and management of globalisation in order to improve business, institutional and governmental decision making. Our mission is to connect AI-level reasoning capacities with human-level critical reasoning capacities for the sake of a better future. The digital data warehouse that we are building is the ‘meat’ of a digital ontology of the global arena. This means creating a visualisation of the interconnections between various global flows, including energy production and consumption, trade, migration and other types of societal, political, economic and environmental flows. It also includes information and trends relating to defence and security. It includes not only the interconnections between different flows, but also the origin, development and transformation of all this information. It provides an extremely complex, thorough and deep understanding of what the global arena – our world – looks like. Imagine that you can see all the neurons and cells in a human body and brain. Now imagine, like a science fiction movie, that we can experience a similar visualisation of the globe, with all its political, economic, technological, digital and other interactions. It sounds impossible or even arrogant, but the technology to be able to do this finally exists and GARI has the idea of using it for this purpose. As for the challenges we face… where to begin? It hasn’t been done before, the technology is still developing, it requires enormous funds and it demands a new intersection between the world of technology and the social sciences that is difficult to grasp in an elevator pitch. However, we have built a symposium around the determination to focus on opportunities and not challenges, which in this project, is not difficult to do. The possibilities of the project are just too exciting and amazing. We have told some incredibly important people what GARI is and the reaction has been excitement and the question “what next?”. We are starting to mine data and create a global intelligent digital data warehouse which will allow us to visualise various key flows (energy, social, foreign direct investment and others) in the Visegrád region (Poland, Czech Republic, Slovakia and Hungary), Austria and Germany. We have already started mapping the flows, we have partnered with some world-class institutions and we are moving at a great speed. I will admit that it is of course difficult and we are facing some challenges, but at the same time, we have gotten to where we are on extremely limited resources and we are miles away from where we started. Apart from the truthfully minor challenge of limited resources, especially finance, there simply isn’t enough time in the day to reach everyone we want to involve and everyone we speak to is interested, so we just simply multiply the task list with each step. According to the GARI, the future of the rule-based multilateral global order on which open states depend is under increasing challenge and the world of academia has so far struggled to offer solutions. Why is this the case and what could be improved? There is only so much a human can research, think about, debate and write up in time for a policy suggestion to be useful and used. This is not to say we should replace researchers with research engines, but that we need to make use of innovative ideas to do what we have already been doing, only better and based on the ‘whole picture’ and not just what we had the time and capacity to find out. Imagine creating a foreign policy recommendation in the 1890s without a collection of on-the-ground reports, extensive military literature written by scholars and a congregation of advisors available in the war room next to your office. Now imagine making that report in the 1940s without the Library of Congress, or without digital intelligence and the internet in the present day. GARI are inventing a library, the internet of tomorrow—a massively comprehensive and real-time-updating source of information that is available to you in every capacity and providing any and all data. Research based on specific data in the context of all data globally can make for a well-researched policy recommendation, report on a situation or potential progress and forecasting like never before. What can be improved, and what we are forming, is the background research—our policies, actions and choices can be based on more than a couple of articles and someone’s opinion. The ‘Next 100 Symposium‘ was recently held by the GARI in Prague, marking the centenary of the end of the First World War. This Symposium was described as “a global future-oriented meeting”. What were the most significant outcomes and were there any developments which surprised you? The Next 100 Symposium provides a global platform to link technological progress with social and political advancement and to therefore convert societal anxieties into global empowerment. Already it is clear that we have a very unique combination of topics and interesting pathways created between them by the varied array of brilliant speakers. I write this as I read a two-page article in the Economic Daily, the top newspaper of the Czech Republic, about our speaker Frédérick Bordry, the Director of Acceleration and Technology of the Conseil Européen pour la Recherche Nucléaire (CERN). He talks about Europe’s need to harness talent in the fields of technology, data science and engineering. There is a need for big, bold and risky ideas and for structural and European support. What surprised me at the Next 100 Symposium was how matter-of-fact the data scientists and technology experts are about what exists, what condition different pieces of innovation or technology are in and their potential. This was in contrast with how unsure, fearful and sceptical the social scientists, political thinkers and academics still were. It wasn’t a surprise in that we knew of this contrast—it is one of the driving motivations of GARI and we designed the Symposium to bring them together to witness this contrast first hand. What is surprising is that the people in technology listened, were interested and even wrote things down, while the social science thinkers rejected and waved their hand at the potential and innovation that the technology experts presented. How is it that natural science thinkers are open to knowledge and social science thinkers are closed to it? To be honest, I do have an opinion on this, and it is that those working as policy experts and academics hold old-fashioned, yet powerful theories (academic and philosophical) and they become arrogant in their ‘ownership’ of opinions and decisions. They don’t want to upgrade to better decision making, as it’s currently being conducted based on their extremely narrow and personal expertise—it’s an autocracy on information, and who doesn’t love being in an autocracy if you’re in power? The GARI is supported by the International Visegrad Fund, a donor organisation established by the four Visegrád countries (Czechia, Hungary, Poland and Slovakia). How do you see the future of Visegrád cooperation evolving, in light of the aforementioned challenges to international order and political developments in those countries? It is a very difficult time for democracy. It is being stretched and some key players in the Visegrád countries are counting on it quietly and almost unnoticeably breaking. Or perhaps they have simply found a way to make democracy so flexible that it will continue to stretch until it is unrecognisable, but still somehow passable as democracy, however warped. That is the kind of world we are living in if the US continues the way it’s been developing its rhetoric; there are hardly any guidelines to stick to. The carefully written dialogue between the West and Russia, China and North Korea has been somewhat ‘cartooned’ but maintained in the setting of serious international relations. I don’t think it will last long, however, we can’t just ignore the past four years of a changed narrative. It is quite possible that with the dawn of free movement (at least in the EU), rising economic wealth and entertaining diversions like mobile apps, Netflix and foreign culinary innovations available to everyone in Europe, the people just don’t care who is in power. Does it really affect them? If a law suddenly prevents them from securing one of their favourite things (university education, career, family life, sports or anything), they can just move to another country. Migrating seems to take less effort and brings more benefit than being an active citizen. If anyone declares they are not on the brink of giving up on politics all the time, they are simply lying. It isn’t due to the state of politics now, it is simply a symptom of political awareness that you are frustrated, especially in a democracy, where you are told you hold the power, but are constantly in a battle with the rest of the population about what we all use it for collectively. The Visegrád is an example of out-dated politics which is getting away with it because society is progressing and developing (and digressing) despite politics. I’m involved in several projects and GARI is the biggest one. I’m quite hyper so I usually do multiple things in diverse fields. I am about to publish a report on the overall media landscape in the Czech Republic through my think tank Go Think Initiative which analyses the future trends of media and communication technology and the impact on society and politics. At GARI, we are in full swing organising the second annual flagship event, the Next 100 Symposium, as well as the second year of the ReDefine Next 100 global youth programme. I am travelling to the USA to meet with key people, companies, political departments and institutes for GARI at the end of March. There is a lot to do! We are actually currently conducting some very early stage meetings about establishing a ‘CERN’ for Artificial Intelligence. Europe does not have a centre for AI, and we need one. What advice would you give to young scholars of International Relations or those interested in studying the relationship between advanced technology and the social sciences? I’d say those are, at the moment, two very different things. There are hardly any courses, let alone discussions on the intersection of advanced technology and the social sciences. I would encourage those studying international relations to challenge the subject by asking what it means in the age of innovation, blockchain, a possible quantum breakthrough, big data and privacy, to name a few things. Because I enjoyed discussing neo-realism and reading Kenneth Waltz, but with what we are facing today, and with the opportunities and tools of today, that is philosophy and literature. It is wonderful studying the ideas and opinions of people that have died long before those studying them were born. But if those students want to work in politics, journalism, finance or law, they need to be reading things written today, or at the latest, yesterday, perhaps in comparison to what was said last week, and in the context of what the international order and structure looks like in the present day, because they won’t find much relating to that in Francis Fukuyama’s essay or John Keanes’ recommendations. Those are all important to know, we need to know how we got here and what the ideas of the past are, but that is the subject of History, not International Relations. My advice is that an employer like Bloomberg or the European Bank for Reconstruction and Development won’t hire someone for policy that studied International Relations. They will hire someone who can grasp the complexity of reality and the international arena, and that is not a 24 year old that has spent their entire life in a room full of opinionated scholars. So if a young ambitious graduate wants to enter the killing field, they need to have something unique. They need to have knowledge and ideally practical experience that can be applied today. What will you use Schumpeter’s theory of atavistic behaviour for at the Aspen Institute or European Commission? Study something that reflects the world as it is today, not how it was 70 years ago. Unless, of course, you want to become a Professor of International Relations, in which case you should study International Relations.